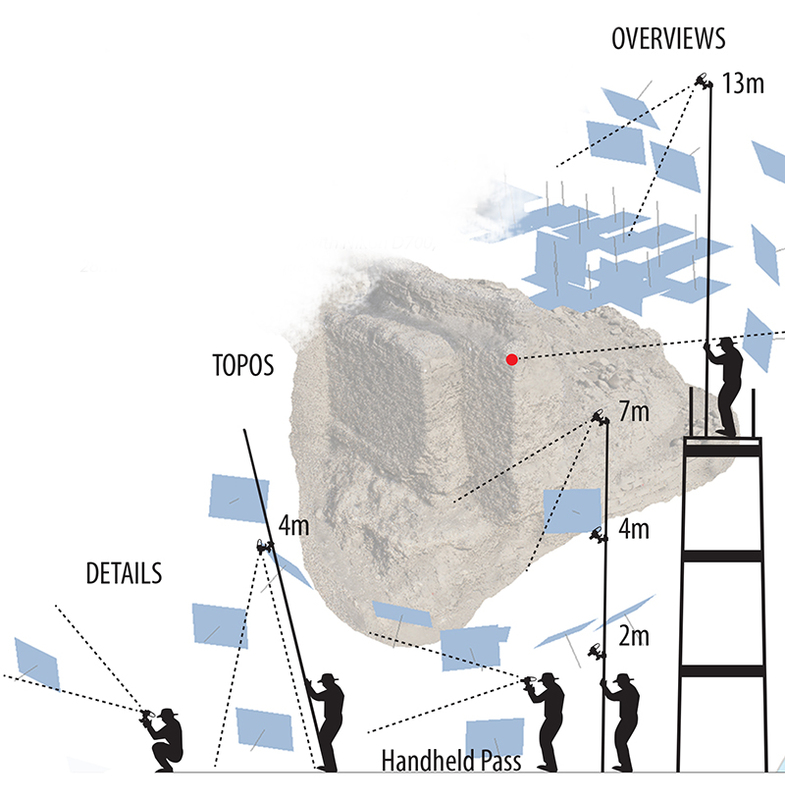 What follows below is an in-depth version of a 2015/16 field report adapted as a short working paper and poster submitted to the Arqueologica 2.0 Congress on Archaeology, Computer Graphics, Cultural Heritage and Innovation (http://arqueologica8 NULL.webs NULL.upv NULL.es). 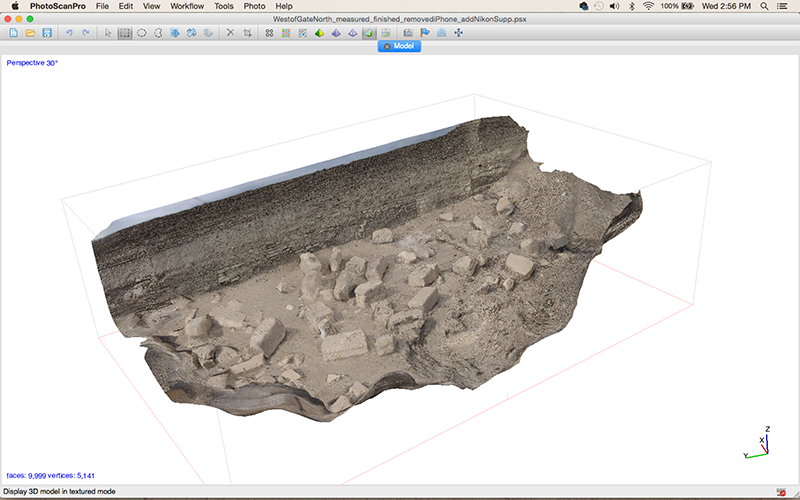 It is part of ongoing research and documentation efforts of The Epigraphic Survey/Chicago House (https://oi NULL.uchicago NULL.edu/research/projects/epigraphic-survey) from the University of Chicago’s Oriental Institute (https://oi NULL.uchicago NULL.edu) under the guidance of Ray Johnson & Jen Kimpton and in collaboration with Hilary McDonald (http://hilarymcdonald NULL.photoshelter NULL.com/). The Western High Gate of Medinet Habu is located in Luxor, Egypt, on the west bank of the Nile and is one of two fortified gates in the great girdle wall that surrounds the Medinet Habu temple complex. It was first investigated and recorded in 1931/32 by Uvo Hölscher (https://oi NULL.uchicago NULL.edu/sites/oi NULL.uchicago NULL.edu/files/uploads/shared/docs/oic18 NULL.pdf) during the 5th campaign of the University of Chicago’s Oriental Institute (https://oi NULL.uchicago NULL.edu/sites/oi NULL.uchicago NULL.edu/files/uploads/shared/docs/oip55 NULL.pdf). 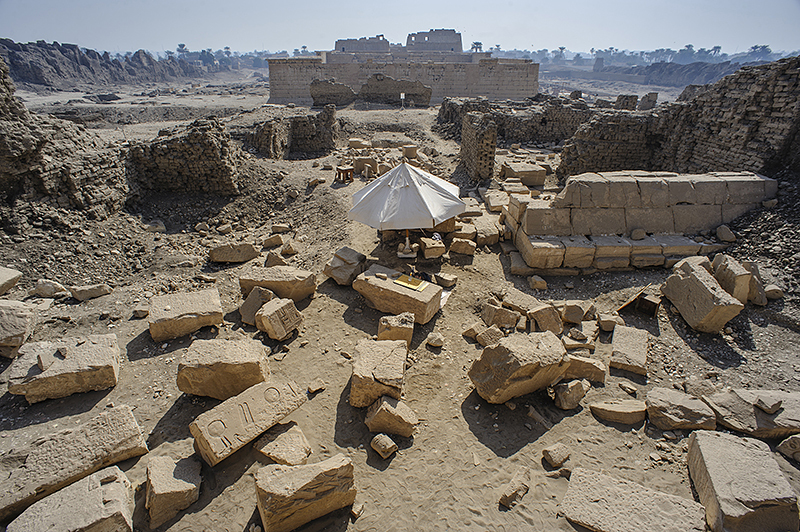 Unlike the east gate, whose stone architecture remains largely intact, the west gate was attacked towards the end of the 20th dynasty, with large blocks toppled from the upper courses of the structure and subsequently buried under rubble and debris. It was then likely razed to the ground along with portions of the adjoining girdle wall during the 21st – 24th dynasties and used as a stone quarry. As such, a few foundation blocks of the south tower are all that remain in situ of the stonework, though large sections of supporting mud brickwork are still in place. Conversely, the supporting mud brickwork of the east gate was destroyed during a ’clearing’ of the temple complex during the late 1800’s. Although their dimensions differ, Hölscher’s excavation of the foundation of both gates revealed them to be of very similar construction — the western gate being slightly larger — and this, paired with an analysis and comparison of in situ east gate blocks with those excavated from the rubble and debris at the west gate allowed him to conclude that, “the west gate closely resembled the east gate in construction and surfaces intended for display” (Hölscher 1951). The two gates thus provide a sort of inverse impression of one another; the study of each allowing a better understanding of their whole appearance and function in antiquity. 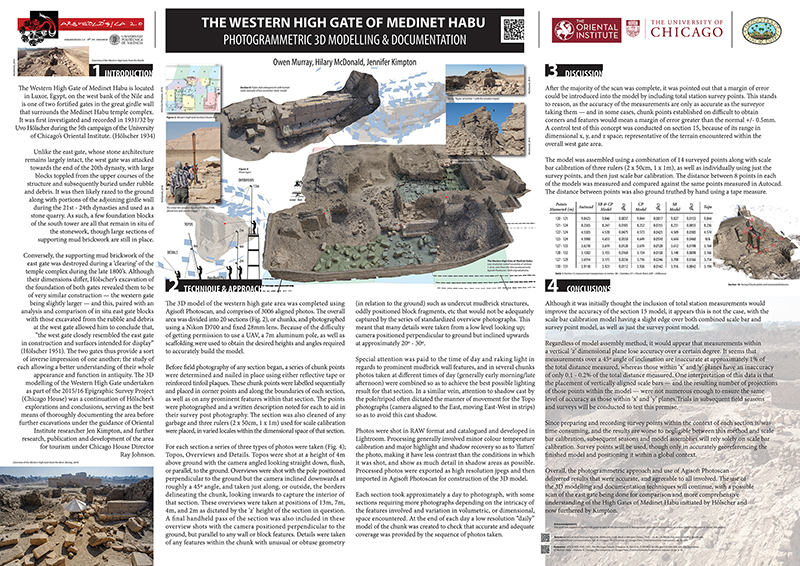 The 3D modelling of the Western High Gate undertaken as part of the 2015/16 Epigraphic Survey Project (Chicago House) was a continuation of Hölscher’s explorations and conclusions, serving as the best means of thoroughly documenting the area before further excavations under the guidance of Oriental Institute researcher Jen Kimpton, and further research, publication and development of the area for tourism under Chicago House Director Ray Johnson. Software: A number of different commercial and research based programs were discussed (Agisoft Photoscan, Pix4D, Mic Mac, Structure, 123D Catch, Datem) and two were selected for trial; Agisoft Photoscan (http://www NULL.agisoft NULL.com) and Pix4D (https://pix4d NULL.com). Agisoft Photoscan was chosen because of the ease of use, graphical user interface and accuracy of results. Before commencing the scan, selected areas were used to test the capabilities of the program and develop a work methodology allowing for a complete survey of the area in the time available and with the resources at hand. Trial: The first trial was completed using a ladder, tripod and timer feature of the camera selected. Previous experience with photogrammetric techniques led to the use of a Nikon D700 and fixed 28mm F/2.8 lens. This initial trial was extremely promising; full and complete coverage of the area in question was completed in 1.5hrs. The subsequent trial incorporated fixed points taken with a total station as well as the use of known distances (scale calibration). This trial resulted in measurable results that were 99.5% accurate; +/- 0.5mm over an area 8m x 4m. This, too, was extremely encouraging and led to the continued use and integration of points taken with a total station throughout the model. At this point, it was thought that the accuracy of these models could be controlled and perhaps even improved by placing measurement points in the corners of said models, relative to the dimensional, or volumetric space being scanned, as well as on any prominent features contained within. The use of control points, subsequently referred to as ‘Chunk Points’, was — and will continue to be — a balance between enough points to allow for as precise results as possible, while at the same time not using so many as to be prohibitive to their survey and accurate recording. In total, 202 points were established over a spread of 21 different sections to help with the fidelity of the models. 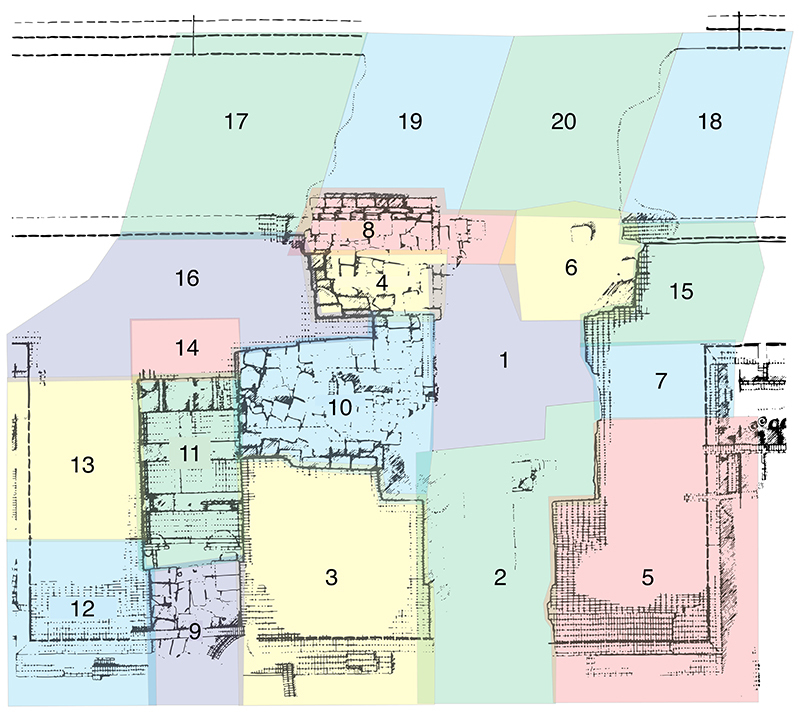 Approach: In consultation with Jen Kimpton, the total area of the scan (approximately 1ha) was divided into 20 sections, with the addition of the House of Butehamon at the end. 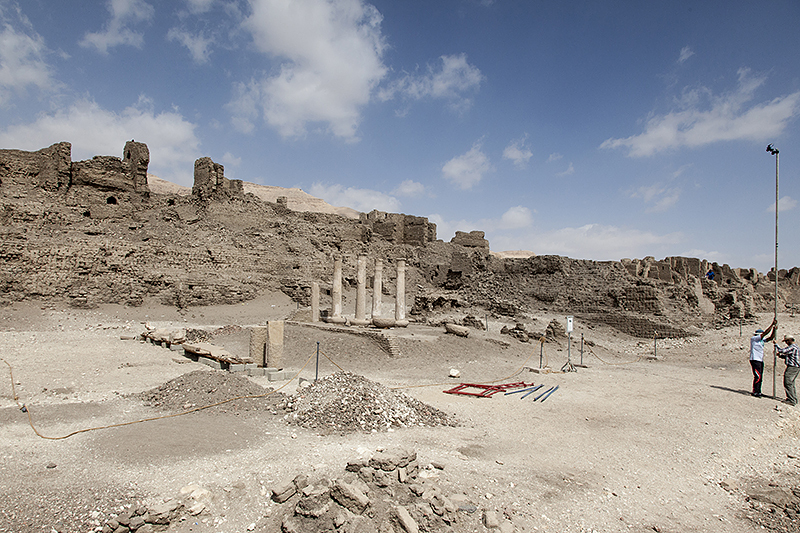 Holscher’s initial survey and excavations provided limited information on the mudbrick structures surrounding and supporting the Western High Gate Pylon in antiquity; the results of this 3D survey/scan were hoped to provide additional information and an improved understanding of those structures. The survey commenced with the Central Axis, first West, then East, and then expanded outwards, with areas being chosen based on day, condition and availability. The numeric before the section, or chunk name indicates the order in which they were shot. Each section/chunk, took approximately a day to photograph, with some sections requiring more photographs depending on the intricacy of the features involved and variation in volumetric, or dimensional, space encountered. From initial trial samples involving a ladder and tripod, a technique was adapted to use a 4m extendable wooden tripod (Hölscher era?) on which a Gitzo ball head and plate capable of rotation at any angle was mounted. The Nikon D700 was out fitted with a modified wireless remote trigger. Raiese Bedauwy Abd Allah, Mohammed Mahmoud, and Ahmed Abd el Haris proved invaluable in orchestrating this work, as their ideas, patience and strength allowed modification of equipment as well as the constant day to day maneuvering of camera-on-pole. Due to the need for added height in the Southern sections and later, South Enclosure Wall, South Slope & North Enclosure Wall, a longer 7m aluminum pole was used in addition to the 4m Holscher-era wooden tripod. The 7m aluminum pole was later adopted wholesale for it’s light weight manoeuvrability. This aluminum pole mounted the Gitzo ball head to a Calmut lighting clamp bracket modified to accommodate the ball head and affixed to the pole at the desired height. Modifications to the wireless remote trigger system along with daily wear-and-tear led to the remote misfiring on multiple occasions; after replacing a 2 LE jack, the system functioned as originally intended. When a height greater than 7m was required, two techniques were employed; the first experimented with two 7m aluminum poles clamped together with roughly 2-3 m overlap, resulting in a 11m length. This was quickly ruled out due to the feeling that with any sudden movements or gusts of wind, the poles would snap and break under their own weight, and was replaced by a 6m high aluminum scaffolding rig on which the 7m aluminum pole was placed, giving the equivalent reach of 13m from the ground. Workflow, Pre-Photography: Before field photography of any section or chunk began, a series of chunk points were determined and nailed in place using either reflective tape or reinforced tinfoil plaques. These chunk points were labelled sequentially and placed in corner points and along the boundaries of each section, as well as on any prominent features within that section. The points were photographed and a written description noted for each to aid in their survey post photography. The section was also cleaned of any garbage and 3 rulers (2 x 50cm, 1 x 1m) used for scale calibration were placed, in varied locales within the dimensional space of that chunk. Workflow, Photography: For any given chunk a series of 3 types of photos were taken; first Topos, second Overviews, and finally Details. Each type of photo included overlap (30%) between it and the next, and were shot sequentially moving in a consistent fashion to aid the program in alignment and tie point recognition. Photos were checked manually in field as needed to ascertain their quality. Topos were shot at a height of 4m above ground with the camera angled looking straight down, flush, or parallel, to the ground. This cartographic perspective provided an easily aligned framework in which the other two types of photographs could be further inserted and aligned. Overviews were shot with the pole positioned perpendicular to the ground but the camera inclined downwards at roughly a 45º angle, and taken just along, or outside, the borders delineating the section, looking inwards to capture the interior of that section. These overviews were taken at positions of 13m, 7m, 4m, and 2m as dictated by the height of the features the section contained. 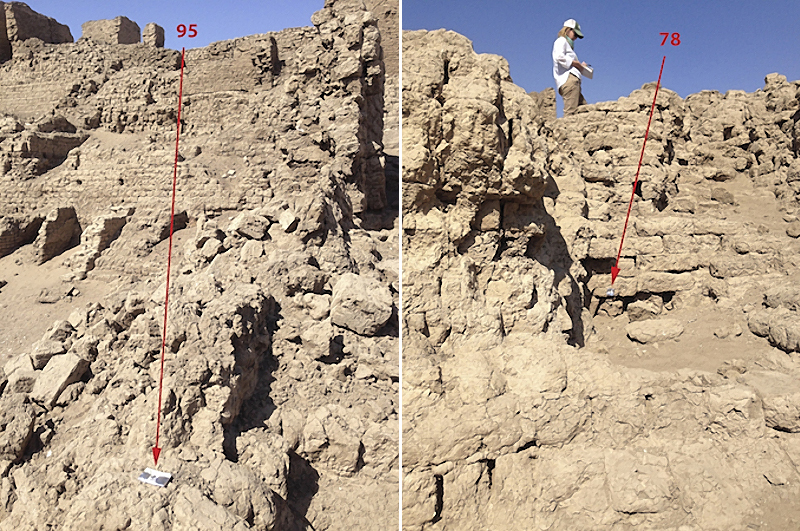 A final handheld pass of the section was also included in these photos with the camera positioned perpendicular to the ground, but parallel to any wall or block features. The perspective and positioning of these type of photos allowed the geometry of individual sections to be captured easily as well as providing a suitable degree of overlap between sections aiding in their ability to align with one another. Details were taken of any features within the section with unusual or obtuse geometry (in relation to the ground) such as undercut mudbrick structures, oddly positioned block fragments, etc that could not be adequately captured by the series of standardized overview photographs. This meant that many details were taken from a low level looking up; camera positioned perpendicular to ground but inclined upwards at approximately 20º – 30º. Workflow, Exposure & Settings: A variance in exposures was required depending on the position of the sun, angle of lens in regards to refraction of light from mudbrick surfaces, and areas of deep shadow. In general, photos on the Nikon D700 were taken at ISO 200, 350@f/11 or f/13. Areas where the camera frame was filled with shadow were adjusted and taken at 180@f/11 and 250@f/11. *Note* As depth of field was important to accurate point recognition, measurement and positioning via the optics (in this case, a fixed 28mm lens) an f-stop below f/11 would have been unadvisable. With a 28mm lens @ f/11, focus could fall automatically as dictated by the features of the chunk without having to worry whether areas nearer or farther from the focus point would appear “in focus”. Special attention was paid to the time of day and raking light in regards to prominent mudbrick wall features, and in several sections photos taken at different times of day (generally early morning/late afternoon) were combined so as to achieve the best possible lighting result for that section. In a similar vein, attention to shadow cast by the pole often dictated the manner of movement for the Topo type photographs (camera aligned to the East, moving East-West in strips) so as to avoid this cast shadow. Workflow, Post-Process (Lightroom): Photos were shot in RAW format and catalogued and developed in Adobe Lightroom (https://lightroom NULL.adobe NULL.com). Processing involved minor colour temperature calibration and major highlight and shadow recovery so as to ‘flatten’ the photo, making it have less contrast than the conditions in which it was shot, and show as much detail in shadow areas as possible. Processed photos were exported as high resolution jpegs and then imported in Agisoft Photoscan for construction of the 3D model. *Note* Photoscan advices using a lossless TIFF format if issues are encountered with fringing — due to the number, and file size, of photos generated by the TIFF format, high resolution jpegs with the least amount of compression possible (setting of 12) were used instead. Workflow, Model Assembly (Agisoft Photoscan): Agisoft Photoscan was installed on a late model 2013 Macbook Pro with a 2.7 GHz Intel Core i7 processor, 16 GB of RAM and NVIDIA GeForce GT 650M Graphics Card. All time time lengths indicated below are a result of these specifications. Faster processor/s, more RAM and advanced graphics cards will speed up the calculations and processing involved in model assembly. The model of the Western High Gate was assembled in individual chunks; each chunk took approximately one day to photograph and after on-site photography, a “low resolution” model of the chunk was created to check that accurate and adequate coverage was provided by the sequence of photos taken. 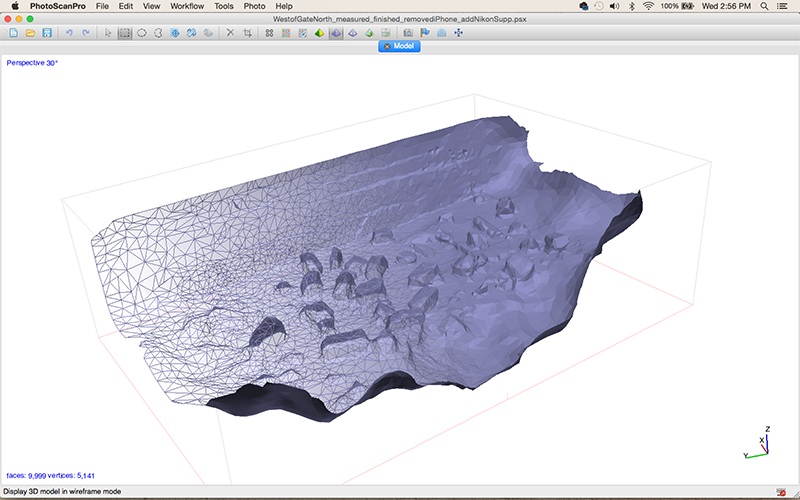 The process of assembling a section/chunk in Photoscan is relatively straightforward. After importing photos for a specific chunk, the photos were aligned, and common tie points between the images established. Depending on the number of photographs and resulting tie points, the alignment process was relatively quick; 1-2 mins for a series of 75 photos, 4-5 mins for a series of 250 – 300 photos. Alignment of chunk photos resulted in a sparse cloud visualization of these common tie points in space; relative to one another and the camera positions, (referred to as ‘camera stations’ in Photoscan) from which they were taken. At this point, any non-aligned photos or sequences were reviewed. 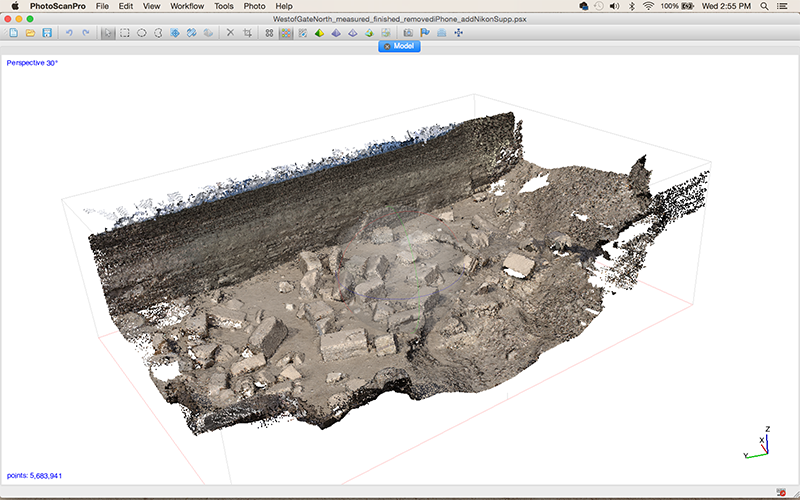 With most individual chunk models there were no problems with combining the different types of photos taken on site; Topos, Overviews and Details, however on occasion, and specifically when combining multiple chunks, a more specified build/alignment pattern was required. This involved importing and aligning a specific type of photo first, and then saving the results, before reintroducing other photo types and sequences which previously had been unable to align. *Note* Building chunks independently and then aligning them wasn’t employed for this section of the survey; the resulting overall model of 3006 photos was built in one chunk. 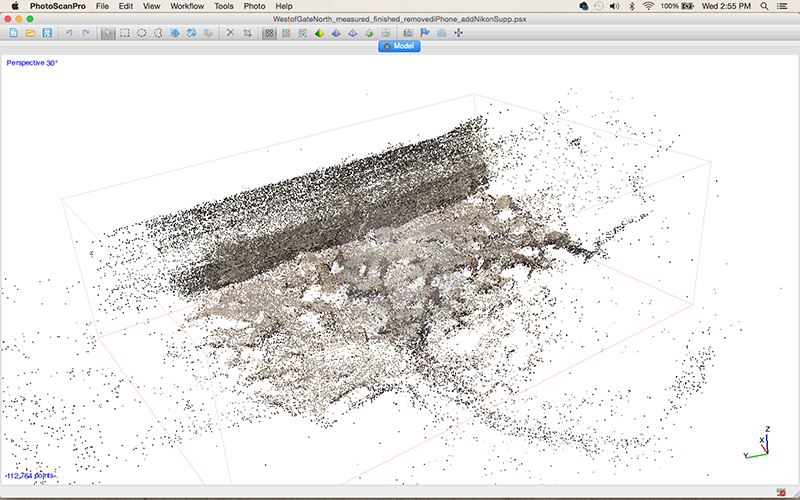 From the aligned photos and sparse cloud visualization, a dense cloud of points (resulting in a similar LIDAR laser scan point cloud array) could be generated. The density of this dense cloud is determined by a series of 5 settings: Highest, High, Medium, Low and Lowest, that effectively control the number of points included in the dense cloud (resolution) via a sampling algorithm of the jpegs used to generate the model. A ‘low’ setting provided an effective dense cloud for generating a low resolution model and required only 10-15 mins to build. Visualization of the dense cloud provides quite a photo realistic appearance as these points combine to form an image, in a very similar fashion to mechanical presses and/or inkjet printers (the Impressionists might be impressed). Dots on a at 2 dimensional surface are now points in 3 dimensional space, measured and aligned self referentially; both create the illusion of form. By evaluating the dense cloud, any areas with sparse and inadequate coverage could be determined and re-photographed/sourced in the field. 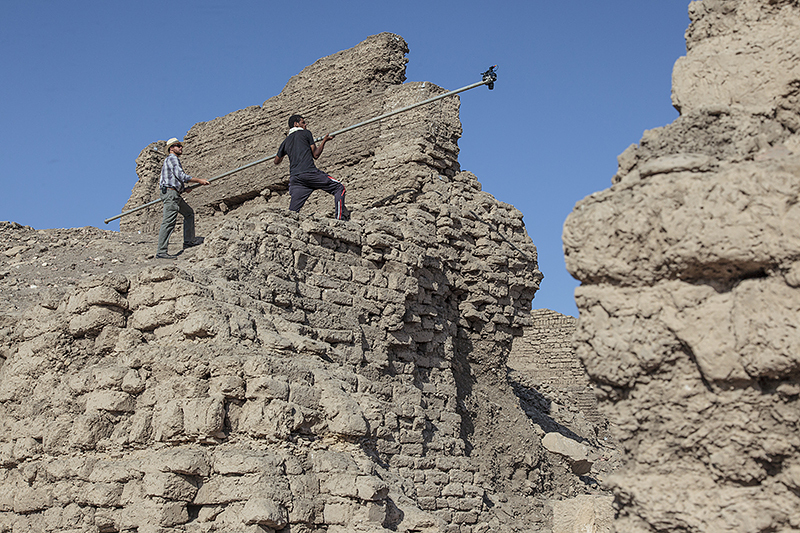 This evaluation technique proved essential in covering the highest points in the survey, a mudbrick wall atop the North and South Slopes. It is important to note that up until this stage in the process the visual and aesthetic information conveyed via the photographs is of no importance — or rather, that the photographs are only aids in the accurate measurement and recording of points in space and the resulting geometry of the objects/terrain they cover. Instead of laser, light is used as means of measurement; thus until this stage in the process, the camera is merely a tool for accurately observing and recording distance and ascertaining relative position. Following evaluation, the dense cloud was trimmed and cleaned up using an assortment of Photoscan selection tools to accurately reflect the boundaries of the chunk in question (3 dimensional cropping). From the cropped dense cloud, a mesh model measured in tile faces was generated — a series of polygon shapes drawn from various points in the dense cloud — to accurately reflect the surface geometry of the section. As with the dense cloud, using a low setting with relatively few tile faces (20,000 – 30,000) allowed this model to generate quickly (2-3 mins). After mesh generation the same series of photos used for measuring distance were used to create texture, and it is at this point that the beauty of the photogrammetry process reveals itself. The visual and aesthetic qualities conveyed via the photographs are now skinned onto the model of measurements provided by them, resulting not only in an accurate spatial and geometric fidelity but accurate visual reference, too. The then textured low resolution model was exported as an interactive Adobe PDF, available to anyone with the free Adobe PDF reader. The generation of these low resolution models proved helpful not only for quality control but as a means of quickly sharing the results of the survey as it progressed. Experimentation with various presentation and visualization techniques is an active area of interest and Sketchfab’s (https://sketchfab NULL.com) model viewing, VR and embed options have proved invaluable. Future seasons will explore the use of a variety of programs: MeshLab (http://www NULL.meshlab NULL.net), Blender (https://www NULL.blender NULL.org), Z-Brush (http://pixologic NULL.com), CapturingReality (http://capturingreality NULL.com) and CloudCompare (http://www NULL.danielgm NULL.net/cc/). After a majority of the sections had been photographed, it was pointed out that a margin of error could be introduced into each section model as well as the overall model by including total station survey points. This stands to reason, as the accuracy of the measurements are only as accurate as the surveyor taking them — and in some cases, chunk points established on difficult to obtain corners and features would result in a margin of error greater than the normal +/- 0.5mm. A control test of this concept was conducted on section 15, as it provided a good representation of the terrain encountered within the overall west gate area. Model 15 was assembled 3 times; first using a combination of 14 surveyed chunk points for that section, along with scale bar calibration of three rulers (2 x 50cm, 1 x 1m), the second time using just the 14 surveyed chunk points for that section, and the third time using just the scale bar calibration of three rulers. The distance between 8 points in each of the models was measured and the 3 different models were compared against one another, as well as against the same points measured independent of Photoscan, in Autocad, as well as against the distance ground truthed by hand using a tape measure. Although it was initially thought the inclusion of chunk point total station measurements would improve the accuracy of the section 15 model, it appears this is not the case, with the scale bar calibration model having a slight edge over both combined scale bar and chunk point model, as well as just the chunk point model. Regardless of model assembly method, it would appear that measurements within a vertical dimension lose accuracy over a certain degree. It seems that measurements over a 45º angle of inclination are inaccurate at approximately 1% of the total distance measured, whereas those ≤ 45º have an inaccuracy of only 0.1 – 0.2% of the total distance measured. One interpretation of this data is that the placement of vertically aligned scale bars in a ‘z’ plane — and the resulting number of projections of those points within the model — were not numerous enough to ensure the same level of accuracy as those within ‘x’ and ‘y’ planes. Trials in subsequent field seasons and surveys will be conducted to test this premise. Since preparing and recording chunk points within the context of each section is/was time consuming, and the results are negligible between this method and scale bar calibration, subsequent seasons and model assemblies will rely solely on scale bar calibration. Total station survey points will be used, though only in accurately georeferencing the finished model and positioning it within a global context. Overall, despite the inability to use UAV technology, the camera mast system and photogrammetric approach utilizing Agisoft Photoscan delivered results that were accurate, resulting in a model agreeable to all involved. The use of these 3D modelling and documentation techniques will continue in future seasons, incorporating and updating Hölscher’s initial survey. This entry was written by Owen Murray, posted on August 24, 2017 at 3:32 pm, filed under Photogrammetry, Photography and tagged 3D Modelling, Cultural Heritage, Documentation, Egypt, Luxor, Medinet Habu, Mortuary Temple, Photogrammetry, Ramses III, The Western Gate of Medinet Habu, West Bank. Bookmark the permalink. Follow any comments here with the RSS feed for this post. Post a comment or leave a trackback: Trackback URL.